Normally companies prefer their news releases to be bite-sized morsels no longer than a page. So when the media leveled allegations of emissions fraud against General Motors' European unit, the nine-page response detailing GM's position hinted at panic. It was titled "Statement of the Adam Opel AG on the Current Diesel Discussion," but one of Germany's leading newspapers suggested an alternate headline: "The longest denial in corporate history." Opel's response typified the wariness of automakers swept up in the emissions controversy that has engulfed Europe's diesel industry since the U.S. EPA discovered the fraud at Volkswagen. Ongoing news reports revealed a reality that might surprise those outside the world of powertrain engineers and regulators. "Defeat devices" gained prominence thanks to VW, which used such software to turn off its emissions controls outside of government testing. But other automakers in Europe make liberal use of officially sanctioned devices in diesel vehicles that emit nearly as many toxins as VW's. The result is that, even though Europe has mandated a radical decrease in nitrogen oxide, or NOx, emissions over recent years, the use of these "devices" -- essentially software code embedded in the engine control unit -- means that real-world emissions are considerably worse. A variety of euphemisms such as "engine calibration," "acoustic function," "thermal window" -- or in the U.S., "auxiliary emissions control devices" -- describe conditions under which carmakers may minimize or switch off their expensive exhaust-treatment systems in the name of guaranteeing mechanical durability. A recent investigation of 53 diesel models by Germany's transportation ministry discovered broad use of these legal defeat devices. For example, officials found a 1.6-liter diesel BMW 2 series emitted more than five times the legal NOx limit on the road. The 1.5-liter diesel in Renault's Dacia Sandero emitted 1,025 milligrams per kilometer on the road -- 13 times higher than the ceiling in the EU's laboratory testing. Part of the reason the devices are widely used in Europe traces back to a loophole in the European Union's emissions law. In Europe, the law gives automakers wide discretion to use defeat devices to protect the engine or safeguard the vehicle. Andrew Fulbrook, director of IHS Automotive's global powertrain and compliance forecasting, says the U.S. is less affected because it requires manufacturers to submit a list of such devices. "It provides the regulator with an opportunity to agree or disagree with the OEM in his interpretation of the definition of an [auxiliary emissions control device] and if it is a defeat device or not," he said. "It's a clear requirement." In Opel's case, Germany's most influential news weekly, Der Spiegel, ran a cover story accusing the GM unit of using software that instructed its Zafira multipurpose vehicle's diesel engine not to clean nitrogen oxides around 80 percent of the time. The exhaust gas after-treatment system was set to switch off at specific altitudes, vehicle speeds or weather conditions -- circumstances that seemed to fall just outside the test parameters used in the EU's driving cycle. Opel denied it had done anything illegal, but did not dispute many of the findings. Instead it dismissed them as "misleading oversimplifications and misinterpretations of the complicated interrelationships of a modern emissions control system." Ambient temperatures, air pressure and engine load are just some of the 17,000-plus variables taken into consideration by its software, Opel said. As such, fishing out a few elements in isolation of one another presented a distorted picture. "Such a complex system cannot be broken down into individual parameters," it argued. Whereas switching off at 2,789 feet above sea level may seem connected to the fact that the highest testing ground in Europe is found at 2,165 feet, Opel said this in reality was designed to prevent excessive sooting as oxygen levels in the air decrease the farther up a car travels. Other reasons were to stop ammonia from seeping out into the air, which occurs when too much urea is injected into the after-treatment system. Industry executives appear increasingly sensitive when it comes to this hot-button topic. Either they risk coming across as if they are concealing information from the public or they end up sounding like they want to cow critics into submission by bombarding them with technical details, such as citing 17,000 parameters. The CEO of a German services provider that specializes in engine testing, emissions and development said talking on the record amid such a charged atmosphere was the political equivalent of voluntarily walking straight into a "minefield." "If you look into the regulations, people digging into the legislation itself, they all come back saying it's utterly complex." "What bothers me is the mutual finger-pointing [between politicians and manufacturers]. We are all sitting in the same boat," he grumbled, adding that both sides bore their fair share of guilt for the EU law at the root of the problem. Roughly nine years ago, a bill was passed in Brussels detailing the process to receive approvals for light vehicles. It banned the use of defeat devices, which it defined as any emissions control sensor that reduces the effectiveness of the system "under conditions which may reasonably be expected to be encountered in normal vehicle operation and use." But lawmakers added a seemingly innocuous qualification, over which the industry and politicians now blame each other for the image crisis: "The prohibition shall not apply where the need for the device is justified in terms of protecting the engine against damage or accident and for safe operation of the vehicle." This sentence opened a legally sanctioned back door for defeat devices in almost any situation because safety is traditionally considered paramount. 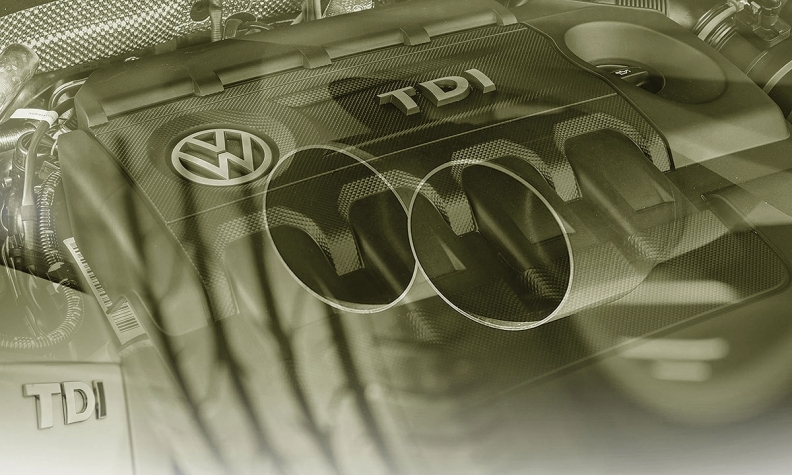 In Volkswagen's domestic market of Germany, independent testing officials complained they were even barred from inspecting the engine management software because this was classified a trade secret. IHS' Fulbrook notes that the EU does not require automakers to declare what devices they use to switch off or minimize emissions controls, "certainly not as clear as the U.S." That allows an automaker "to use his interpretation with very little regulatory oversight," he said. Automakers such as Renault, Suzuki and Hyundai have defended use of defeat devices as necessary to prevent engine damage at certain temperatures, a German investigative committee reported. As a result of the broad use of defeat devices, the gap between actual and EU laboratory emissions widened continuously over time. Even as the maximum permissible limits for nitrogen oxides sank with new legislation, cars continued to belch out NOx in much higher concentrations in the real world. Once hooked up to portable emissions measurement systems, Europe's most advanced diesels were pumping out more than seven times their legal limit on average as soon as they left a laboratory vs. just more than three times the limit in 2005. And that's not just Volkswagen. In fact, only the best performer met the legal limit on the road, while the worst found by the International Council on Clean Transportation had 24 or 25 times that level. Vicente Franco, a senior researcher with the council, says carmakers prefer using less-effective lean NOx traps, or LNTs, because they are cheaper than urea-based selective catalytic reduction and don't pose the added problem of fitting a urea tank somewhere in the car. But the lean NOx traps result in a parasitic loss of fuel that carmakers felt customers would not accept. "There's a 3-4 percent consumption penalty that you have to pay if an LNT is fully operational, so there is an incentive to cut corners or change the calibrations," Franco said. "These systems are fully operational during the homologation test in the laboratory, but then on the road it can be a substantially different picture." Regulators chose to take the assurances of Europe's carmakers at face value when it came to justifications for using defeat devices for engine protection. "Other governments, member states, as well as members of parliament were never interested in the subject, because it was so technical. Nobody was excited about the details," said Erik Jonnaert, a Harvard-trained lawyer based in Brussels. "If you look into the regulations, people digging into the legislation itself, they all come back saying it's utterly complex." Jonnaert, a Belgian national, is paid to know his way around European automotive legislation like no other. As secretary general of industry association ACEA, he is the chief lobbyist for Europe's carmakers in Brussels and has witnessed the industry's loss of trust and credibility with regulators. Amid the constant recriminations in the industry, Germany's auto industry hopes new legislation in Europe known as RDE -- for real driving emissions -- will end the controversy. "We do believe that it will be very helpful to have clear regulation which eliminates these areas of gray where interpretations and perspectives of what is legitimate, what is the real intention of the law and what is written in the law," said Daimler CEO Dieter Zetsche in his capacity as president of the ACEA. Under RDE, nitrogen emissions for new models will soon be tested in a real-world environment for the first time as part of the approval process. "Real driving emissions is actually a blessing for the industry," said Matthias Hofstetter, a senior powertrain engineer at Porsche, who believes the regulation can restore carmakers' lost credibility. Any potential temptation on the part of a carmaker to minimize or switch the after-treatment system off on the road after 6.8 miles or at ambient temperatures outside the 68-86 degrees Fahrenheit range -- both parameters specified under Europe's outgoing test cycle -- would endanger certification. This most likely will lead other companies to follow France's PSA Group and introduce the more expensive selective catalytic reduction technology across their diesel fleet, possibly in addition to lean NOx traps, despite added costs estimated at around $400 per car. Opel has pledged to use selective catalytic reduction on all future compression-ignition engines as of June 2018. For its part, GM's European unit claims it wants to come clean, and avoid in the future the need to deny as "grossly misleading" allegations that its after-treatment systems were programmed to remain off 80 percent of the time. "We already suggested at the end of last year that all manufacturers in Europe should disclose their calibration philosophy to the authorities," Opel said in its denial, "and we are working to do so as part of all our future type approvals."